If you enjoy photographing mother nature and waterscapes, one particularly fun exercise is to capture the beautiful characteristics of the ocean shore. 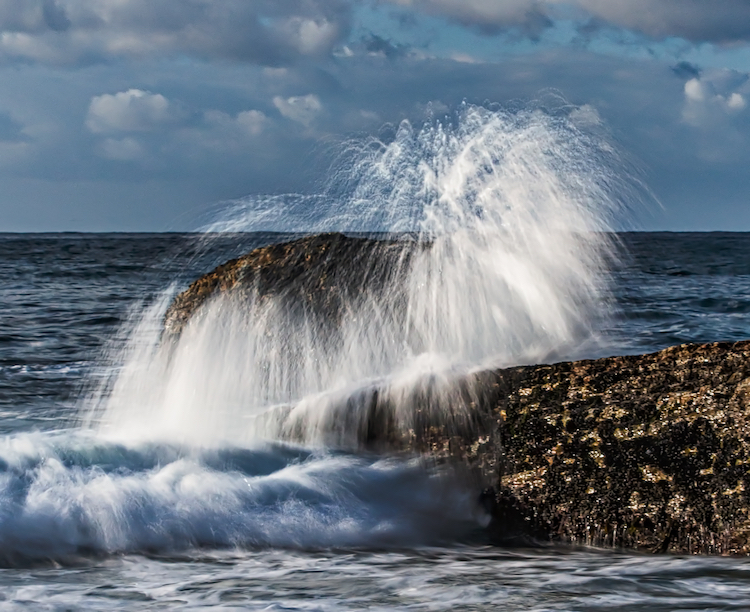 If you are in the right place at the right time, you can create images displaying the delicate balance between the awesome force of a powerful wave crashing into the shoreline, juxtaposed with the calming ebb and flow of the water cascading over the rocks. Use of a tripod is important due to the relatively slow shutter speeds you’ll be working with. Generally speaking, a one-third to one-half second shutter speed range does the job. Perhaps there are lenses and cameras with image stabilization which can help you shoot photographs in this shutter speed range handheld, but I always prefer to keep my setup as motionless as possible to achieve sharp images so I use a tripod. I also always use a remote shutter release, because pressing directly on the camera’s shutter button can introduce slight vibration into the setup during exposure. Ideally you will be shooting a relatively rough surf (more on that later), so choosing a long lens that keeps you and your setup out of harm’s way is important. I typically choose a medium telephoto, such as a 70-200mm zoom, but sometimes a slightly shorter length is necessary to capture a wide enough composition. You may also want to bring a circular polarizer which helps mitigate any glare in the water, and should slightly slow down the shutter speed. You may also want to bring a variable neutral density filter in case it is too bright out to get the correct shutter speeds. If you want to shoot large, powerful waves, pick a location that has incessantly high wind. The higher the winds, the larger and stronger the waves will be. You will also want to shoot during the golden hour, either just after sunrise, or just before sunset. These times of day offer a warm, diffused natural light cast over the beach, and create a nicely saturated background sky. Get to the location early. Give yourself plenty of time to scout it out, and pick an area where you can ideally compose a combination of high waves crashing into the surf, with a foreground of water flowing to and from the beach. If possible, pick a beach with rocks and boulders scattered amongst the surf. Rocks give the waves an extra punch when they land, and further add the element of unpredictable force and power to the photograph. Also, water gently flowing over rocks in the foreground adds an interesting element to the image. When your composition is set (more on that in a minute), put your camera in aperture priority, set your aperture to f/8 or f/11, and fasten the polarizer to the lens. Rotate the filter until you see the sheen or reflection on the water dissipate to its minimum, then stop. 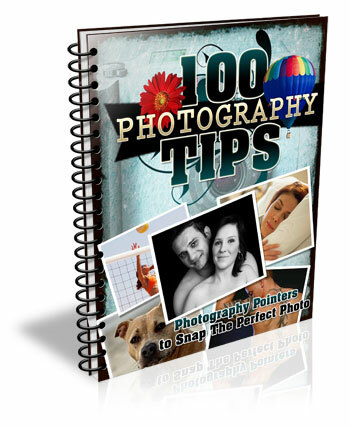 Adjust the ISO to reach a desired shutter speed of around 1/3 to 1/2 of a second. Remember, raising ISO one stop speeds up the shutter by one stop, and lowering ISO one stop reduces shutter speed by one stop, (assuming the aperture stays constant). Depending on how bright it is out, you may need a neutral density filter to slow down your camera’s shutter. Many filter manufacturers make one single filter that has both a polarizer and a variable ND filter combined. Quick Tip: Whenever I use a neutral density filter, I always manually focus before adding the filter. The ND filter will cause your viewfinder to become relatively dark, which makes focusing difficult – sort of like trying to read with sunglasses on in a dimly lighted room. Set your camera so that it shoots continuous photos as quickly as possible, in RAW mode, and fire away! When you compose the scene, leave plenty of extra space around the intended target. Since your setup will be locked in place on a tripod, you won’t be able to adjust your composition once you’re set. Thus, you’re basically taking an educated guess as to where the wave will eventually land. Once you’re set, wait for a wave that’s inside your composition, and let it loose. Shooting wider than necessary greatly increases your chances at nailing some good action shots of waves. Once you’re back at the computer, it’s a piece of cake to crop out the edges and tighten in on the action if necessary. With respect to post-processing, aside from cropping, the only adjustment you might want to consider is a mild boost in contrast. Added contrast will enhance the water’s punch and power, as seen by the viewer. 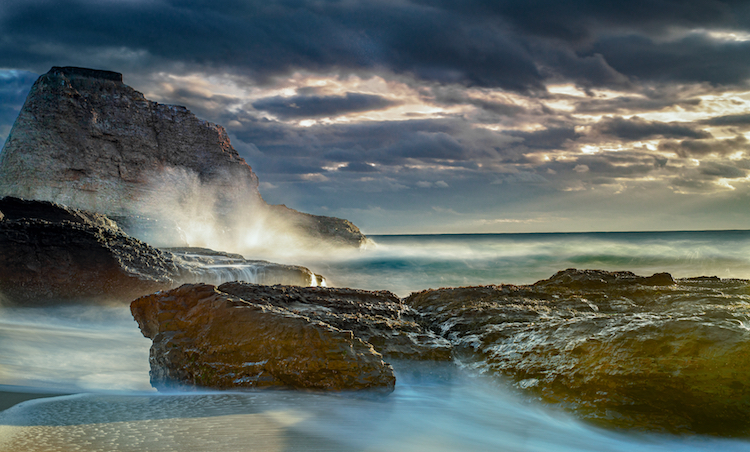 Do you have any other tips for photography the awesome power of nature and ocean waves? Please share in the comments below, as well as your wave images. The post How To Capture Action Shots of Waves by Jeb Buchman appeared first on Digital Photography School.